The smartphone industry has seen a lot of innovation in the last couple of years than what it saw in the last decade. While many brands are focused on solving the real world user experience, there are some companies who think that the problem lies within the specifications. That is why they are coming up with such heavy hardware that you don’t even see on a laptop or desktop these days. Are you confused? Well, don’t be, we are talking about the RAM storage on a smartphone. Some brands believe that their smartphone will offer the best experience if they could just ante-up the hardware on them. It might be true but will purely depend upon the software experience as well. Though, today we are not her to review the handsets; instead, we are hunting for the best 6GB RAM smartphone. With a specifications war going on among smartphone brands users are in for a treat. Below are the best smartphones with 6GB RAM that you can buy in the market right now. Xiaomi’s new Mi Note 2 and Mi MIX phablets are the latest to tout 6GB of RAM under the hood, joining a small but growing club offering more memory than many laptops you will get on the market. There’s only one smartphone with 6GB RAM in India right now, but if you’re willing to import your phone, then there are now a number of different options. Here’s a list of ten smartphones with 6GB RAM that have been released so far. Xiaomi’s new Mi Note 2, up for pre-orders in China presently at CNY 3,299 (roughly Rs. 34,000), is the latest smartphone with 6GB of RAM onboard, and is the only one on this list with a dual curved screen. The Android 6.0 Marshmallow-based smartphone sports a 5.7-inch full-HD (1080×1920 pixels) Oled display, comes with 128GB storage, and is powered by the 2.35GHz quad-core Snapdragon 821 Performance Edition SoC. It bears a 4,070mAh battery and Quick Charge 3.0 fast-charging technology, along with a fingerprint sensor on the home button. The Xiaomi Mi Note 2 sports a 22.5-megapixel rear camera with a Sony IMX318 Exmor RS sensor, and an 8-megapixel Sony IMX268 Exmor RS sensor. Connectivity suite of the smartphone includes 4G-LTE (downlink speeds up to 6000Mbps), Wi-Fi, NFC, Bluetooth 4.2 and USB Type-C. Also on board is the Aqstic audio processor, with 192kHz/24-bit Hi-Fi sound quality. Available at Rs. 27,999 in India, the OnePlus 3 (review) has 6GB RAM along with a Snapdragon 820 processor (two cores clocked at 2.2GHz, and two cores clocked at 1.6GHz). The smartphone features a 5.5-inch Amoled display running at full-HD resolution, and Gorilla Glass 4 protection. It runs OxygenOS based on Android 6.0.1 Marshmallow, and comes with 64GB internal storage (non-expandable). It has a home button with an integrated fingerprint sensor. On the imaging front, OnePlus 3 has a 16 megapixel rear camera with a Sony IMX298 sensor, f/2.0 aperture, OIS and EIS, and PDAF autofocus, RAW image support, 4K video recording, and Smile Capture mode. The front camera bears a Sony IMX179 sensor, f/2.0 aperture on the fixed focus lens, and EIS. The smartphone has connectivity options like Wi-Fi, 4G LTE (support for all bands in India), Bluetooth 4.2, NFC, GPS/ A-GPS, and USB 2.0 Type-C port, along with a 3.5mm headphone jack. It is powered by a 3000mAh battery with Dash Charge fast-charging technology. Another smartphone with 6GB RAM that has been launched in India is the Asus Zenfone 3 Deluxe (ZS570KL), priced at Rs. 62,999. Despite unveiling the device in the country, Asus has not released it in the Indian market yet, though you can get one in the US at $499 (approximately Rs. 34,000). The smartphone has a 5.7-inch full-HD screen and runs on Android 6.0 Marshmallow-based ZenUI. Keeping everything running is a Snapdragon 820 processor. There’s 64GB internal storage and users can expand this by another 256GB via microSD card. Coming to photography, the Asus ZenFone 3 Deluxe (ZS570KL) packs a 23-megapixel primary camera on the rear and an 8-megapixel front shooter for selfies. The connectivity suite of the dual-SIM smartphone includes Wi-Fi, 4G-LTE, Bluetooth 4.2, USB OTG support, USB Type C and fingerprint sensor. It is powered by a 3000mAh battery. LeEco also announced the Le Max 2 (review) with 6GB RAM and 64GB internal storage in the Indian market, at Rs. 29,999. The phone was announced in June this year, but there has been no further word on when the device will go on sale; on the other hand, it is available in China at present for CNY 2,499 (roughly Rs. 25,000). The LeMax 2 smartphone has a 5.7-inch QHD (1440×2560 pixel) screen, Snapdragon 820 chipset, Android 6.0 Marshmallow-based software, dual-SIM support, and fingerprint sensor. On the back, it sports a 21-megapixel camera with f/2.0 aperture OIS, phase-detection autofocus (PDAF), and two-tone, dual-LED flash, while an 8-megapixel selfie shooter with f/2.2 aperture is placed in front. For connectivity, it supports dual-band Wi-Fi, 4G-LTE, Bluetooth 4.2, NFC, Infrared, USB Type C and GPS/ A-GPS/ Glonass/ BDS. Its 3100mAh battery supports Qualcomm’s Quick Charge 2.0 fast-charging technology and can go from 0 to 50 percent in 30 minutes. In China this September, Xiaomi announced the 128GB variant of the Mi 5s Plus, its first smartphone with 6GB RAM; available only in China, the device is priced at CNY 2,599 (close to Rs. 26,000). The smartphone features a 5.7-inch pressure-sensitive display with full-HD resolution capable of 550 nits brightness and NTSC 94 percent colour gamut. 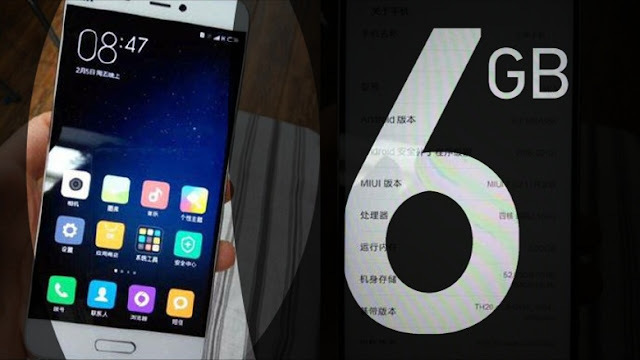 It runs the MIUI 7 software based on Android Marshmallow, and is powered by the new 2.3GHz Snapdragon 821 processor. The Mi 5s Plus bears a dual rear camera setup, with two 13-megapixel sensors – one for colour, and the other for black and white; it supports PDAF and two-tone, dual-LED flash. On the front is a 4-megapixel camera with 2-micron pixels and f/2.0 aperture for selfies. Connectivity options on board include 4G LTE connectivity with 3x carrier aggregation support, NFC, Wi-Fi 802.11ac, Bluetooth v4.2, fingerprint sensor, and GPS/ A-GPS. It has a 3800mAh battery with Quick Charge 3.0 technology that takes the battery from zero to 83 percent in 30 minutes. Unveiled in the US and China and priced at $399 and CNY 2,999 respectively (around Rs. 30,000), LeEco’s Le Pro 3 (first impressions) is another 2.35GHz Snapdragon 821-powered smartphone with 6GB RAM. It has a 5.5-inch full-HD display with 2.5D curved glass, Android 6.0-based EUI 5.8 custom interface, and comes in 64GB and 128GB storage options. Its battery capacity stands at 4070mAh and it supports Quick Charge 3.0 for fast charging. The smartphone also has a fingerprint sensor on the back. The 16-megapixel rear camera of Le Pro 3 has f/2.0 aperture, PDAF, two-tone, dual-LED flash, and HDR support; its 8-megapixel front camera has a 1.4-micron sensor and f/2.2 aperture. For connectivity, the smartphone has dual-band Wi-Fi, 4G-LTE, Bluetooth 4.2, NFC, Infrared, USB Type C and GPS/ A-GPS/ Glonass; however, it misses out on the 3.5mm earphone jack. Lenovo’s Cyanogen-only brand ZUK unveiled the Z2 Pro smartphone with 6GB RAM and 128GB storage in April this year; the smartphone is available at CNY 2,699 (roughly Rs. 27,000). The smartphone has a 5.2-inch display with full HD resolution and Gorilla Glass protection and runs the Android 6.0 Marshmallow based ZUK 2.0 UI. The Snapdragon 820-powered handset has a fingerprint sensor in the hardware Home button. ZUK Z2 Pro has a 13-megapixel camera with f/1.8 aperture, PDAF, 1.34-micron sensor, and two-tone, dual-LED flash; its front camera has 8-megapixel resolution, f/2.0 aperture and 1.4-micron sensors. Onboard connectivity features include dual-band Wi-Fi, Bluetooth 4.1, GPS/ A-GPS/ Glonass, and USB Type C. The smartphone has a 3100mAh battery with Quick Charge 3.0 fast-charging technology. Oppo in October unveiled the R9s Plus phablet with 6GB RAM in the Chinese market at CNY 3,499 (approximately Rs. 35,000). The smartphone, featuring a 6-inch full HD screen, is powered by a 1.9GHz Snapdragon 653 octa-core processor and comes with 64GB built-in storage and microSD support up to 128GB. It runs Android 6.0 Marshmallow with Color 3.0 skin on top out-of-the-box and has a fingerprint sensor below the screen in the Home button. There’s a 16-megapixel Sony IMX398 camera sensor with f/1.7 aperture, dual-core focus, OIS, and LED flash. An additional 16-megapixel sensor is also housed in the front for selfies. It has a hybrid dual-SIM dual-standby card slot and supports connectivity features such as dual-band Wi-Fi, Bluetooth 4.0, A-GPS, and microUSB 2.0. The Oppo R9s Plus comes with a 4000mAh battery with VOOC fast-charging technology. The ZTE Nubia Z11, unveiled in China and expected to launch in India soon, comes in a 6GB RAM variant priced at CNY 3,499 (around Rs. 35,000). The smartphone has a 5.5-inch full HD screen and is powered by a 2.15GHz quad-core Qualcomm Snapdragon 820 processor. The Android 6.0 smartphone packs 64GB of internal storage that can be expanded up to 200GB via a microSD card. As far as the cameras are concerned, the ZTE Nubia Z11 comes with a 16-megapixel primary camera with PDAF, f/2.0 aperture, OIS, two-tone, dual-LED flash, and a 1.28-inch sensor with 1.12-micron pixels on the rear. Its 8-megapixel front shooter has aperture of f/2.4, while the pixel size is 1.4-micron. The dual-SIM smartphone has connectivity options for dual-band Wi-Fi, 4G-LTE, GPS, Bluetooth 4.1, NFC, Infrared and USB Type C. It has a fingerprint sensor as well as a 3000mAh battery with support for Quick Charge 3.0 technology. The world’s first smartphone with 6GB RAM, the Vivo XPlay5 Elite, was launched in China at CNY 4,288 (approximately Rs. 43,000) has a 5.43-inch dual-curved Super Amoled screen with QHD resolution, and a metal body with Gorilla Glass coating. It is powered by a 2.15GHz Snapdragon 820 chip and runs the Android Marshmallow-based Funtouch OS 2.6 software. It has 128GB internal storage, but does not support microSD cards for storage expansion; on the back is a fingerprint sensor. In the optics department, Vivo Xplay5 Elite sports a 16-megapixel rear camera with Sony IMX298 sensor, PDAF, 6P Lens, f/2.0 aperture, and dual-tone LED flash. An 8-megapixel front-facing camera is also present. The smartphone supports 4G LTE networks (Indian bands included), Hi-Fi 3.0, Wi-Fi, Bluetooth 4.2, GPS, micro-USB 2.0 (with OTG), and comes with a 3600mAh battery.